Originally located on the shores of the White river at the current site of Shadowrock Park, Forsyth was an important river town from the early 1800’s. Steamboats used to come up river and drop supplies at the town’s docks, which were then transferred to wagons or smaller boats for distribution in the surrounding areas. By the time of the Civil War, Forsyth citizens primarily consisted of farmers due to the rich river bottom soil. Taney County was established in 1837, with Forsyth becoming the county seat in the following year. The first county courthouse was built at the confluence of Swan Creek and the White river. In 1855, a new, brick courthouse was built on the same site. During the Civil War, both Rebel and Federal Forces occupied the town. The town was held in Rebel hands until 1861 when Union forces shelled the town and damaged the courthouse. In 1863, Union forces abandoned the town, burning it behind them rather than let it fall into Rebel hands. After the war, the courthouse was repaired. It burned again in 1865 and in the process, destroyed most of the records. A new courthouse was built in 1889. In 1913 Powersite Dam was completed and behind it formed Lake Taneycomo. At that point in time, the lake was thought to be the largest water storage facility in the country that was designed for electric power generation. In 1950, the entire town had to be moved to the bluffs overlooking the river. 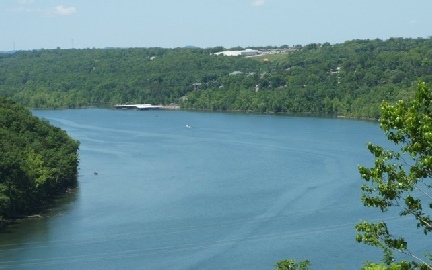 Bull Shoals Lake, a result of the new Bull Shoals Dam , flooded the area. The new location is where Forsyth now stands. For more information on the history of Forsyth and surrounding area, please visit the Forsyth Library or click here to go to the White River Valley Historical Society web page.